If you are planning your wedding for this year, you know how hectic the process can be. There are so many things to remember! There’s the venue, food, the cake, flowers, decorations, invitations, and so much more. There’s one important detail that you don’t have to stress about, and that’s your hair and makeup. Because you’ll want to look your very best in all those photos that will last a lifetime, professional hair and makeup services are an important part of your special day. You’ve coordinated all the bridesmaid dresses to complement your wedding dress. Coordinating hairstyles and makeup is also an important part of bringing together your theme. Do you have a soft, romantic style? Chic and sophisticated? Relaxed and casual? Either way, you’ll want everyone’s hair and makeup to fit in, and professionally styled hair and makeup helps those photos look perfect. The most important part of your wedding is that you enjoy that once-in-a-lifetime experience. 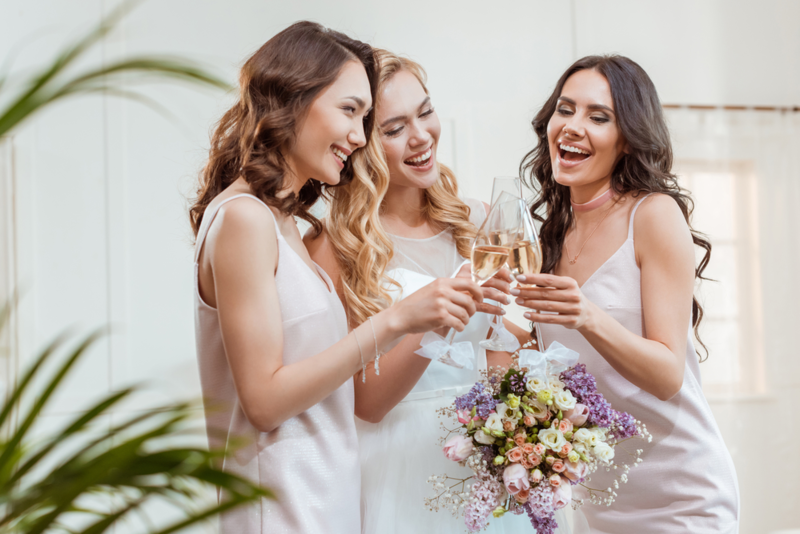 Part of that experience is sharing the occasion with your bridal party. Coordinating your hair and makeup styles also means spending a fun afternoon together at the salon! What better way to relax and enjoy each other’s company before your big day? In addition to hair and makeup, the whole bridal party can enjoy a day of pampering that includes professional spa manicures and pedicures. Memories of this time together will last a lifetime! You’ll want to prepare as far as possible in advance, especially if you want to grow out your hair a bit, so have your consultation with your stylist as soon as possible. Bring photos of your dress and those of your bridesmaids, as well as your color scheme and wedding theme ideas. The more your stylist knows about your wedding, the easier it is to customize your styles. If possible, do a trial run of hair and makeup well in advance to see how you like your coordinated styles, while there is still time to make changes. Have an upcoming wedding? Make an appointment for your consultation today at Utopia Salon & Day Spa. Our well-trained, professional stylists and makeup artists are dedicated to helping you look and feel your best for your special day! You can find us at 510 North East Avenue in Vineland, New Jersey or call us at 856-794-9200 to schedule an appointment. If you prefer, you can instantly schedule an appointment yourself by downloading our free mobile app at the iTunes Store, on Google Play, or on Amazon.